Jeff's Arduino Blog: EMSL "Diavolino"! 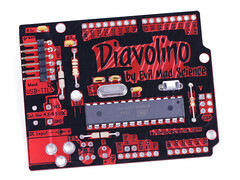 Windell from Evil Mad Scientist Laboratories ("EMSL") announced a new Arduino-compatible board today: Diavolino! Designed to be programmed with an FTDI USB cable (6-pin), the awesome-looking $13 kit comes with just enough to get started, including an ATmega328 pre-loaded with the Arduino bootloader. Pin headers cost an extra $1.50, and you can power it with an optional $1 3xAA battery box with switch, which should supply 4.5V (using alkalines). Very cool kit from some very cool people, and (according to my Arduino-compatible board spreadsheet,) currently the lowest-priced way to get access to the big wide world of Arduino shields.